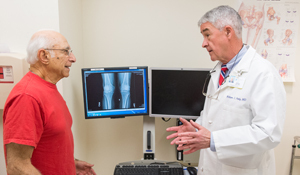 Our surgeons have performed more than 10,000 hip and knee replacement surgeries making us one of the most experienced hospitals in the area in joint replacement. Studies show that the more high volume arthroplasty services show better patient outcomes. The surgeon replaces an arthritic or badly damaged hip joint with man made parts (implants or prostheses). The surgeon replaces a hip implant that has loosened or failed with a new one. The surgeon replaces the arthritic or badly damaged knee joint with man made parts (implants or prostheses). The surgeon replaces a knee implant that has loosened or failed with a new one. In this procedure, the surgeon replaces the worn portion of the knee joint while the remainder of the knee joint is left unchanged. A minimally invasive procedure in which the surgeon inserts a tiny camera through a small incision in the hip and views the joint on a video monitor. The cartilage or bone damage is repaired with tiny instruments inserted through a separate incision or portal. This procedure is done as an outpatient. The surgeon inserts a camera about the size of a pencil through a small incision and then views the joint on a video monitor. The surgeon repairs the joint damage using thin instruments inserted into additional tiny incisions or portals. The surgeon corrects poor alignment of the joint or redistributes weight. The procedure is performed to relieve pain, improve function and prolong the life of the joint. The surgeon uses surgical procedures to bring the fractured parts of the shoulder together and repair them with wires, pins, plates or screws. To learn more about the Kaplan Joint Center or to make an appointment to be seen by one of our providers within 48 hours, please fill out our online appointment request form, call us at 855-KNEE-HIP (855-563-3447) or email us.